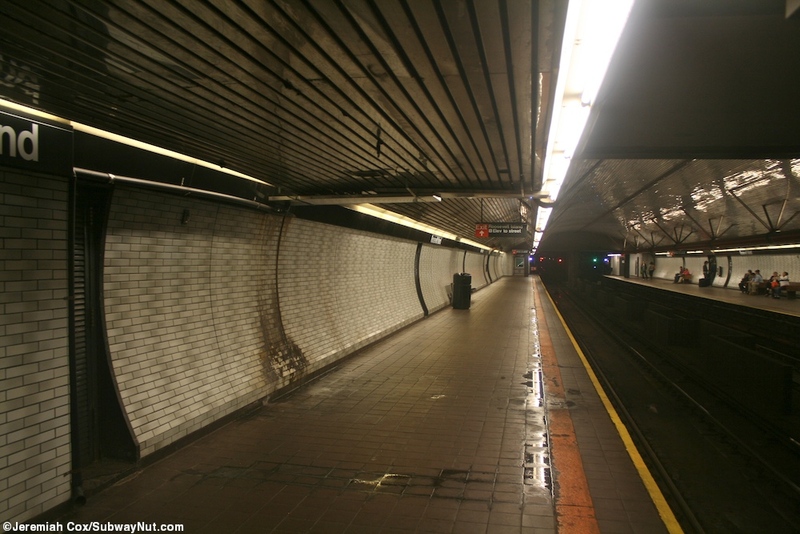 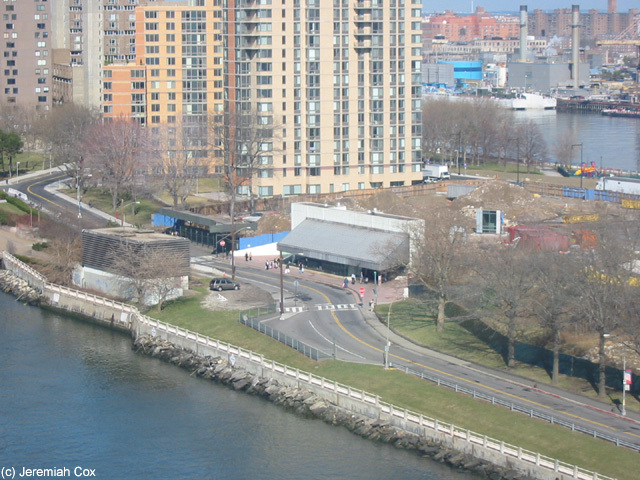 Roosevelt Island is the second deepest NYC Subway Station on New York's newest branch and underwater tunnel opening on October 29, 1989. 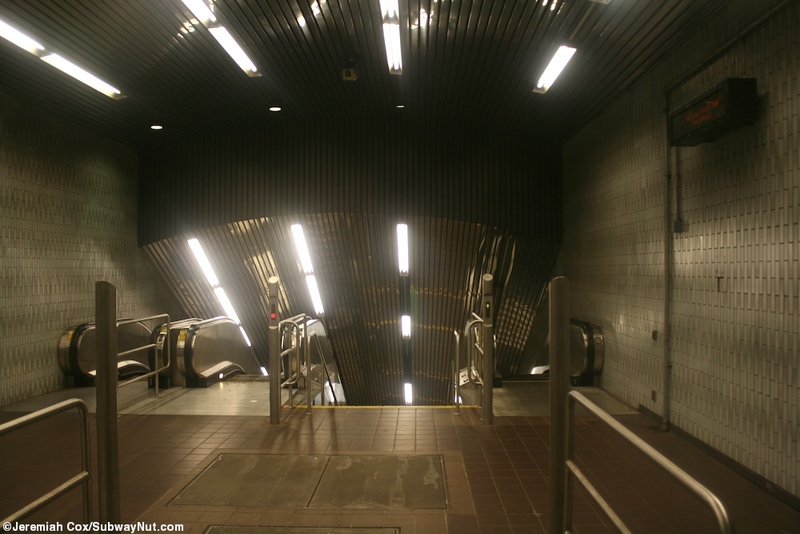 The station was one of the main reasons the new 63 Street tunnel was built along with plans to alleviate crowding on the Queens Blvd line that took a further 12 years to accomplish much less of than originally planned due to scale backs (originally the line was to connect with a new super-express line providing additional track capacity) along with East Side Access on a lower level that is still under construction. 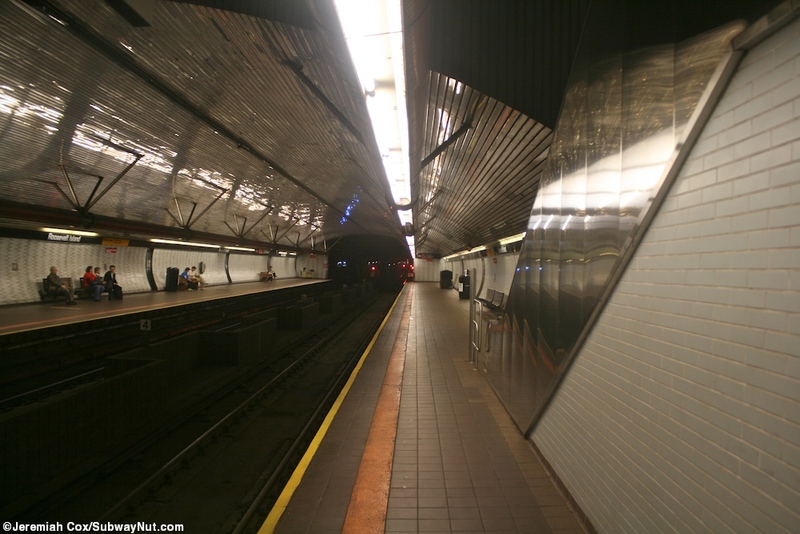 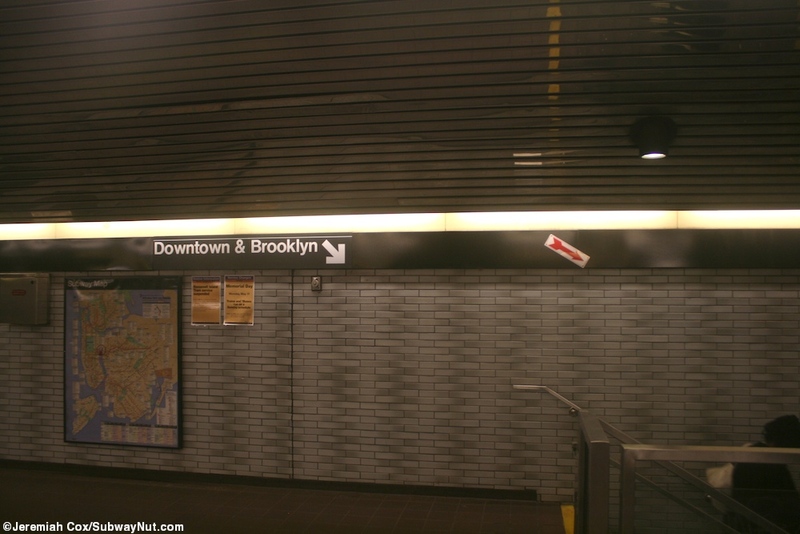 The station serves Roosevelt Island, a planned community of high-rise developments and local retail services that is part of Manhattan in the East River (and contains the only street called Main Street in Manhattan, New York, NY). 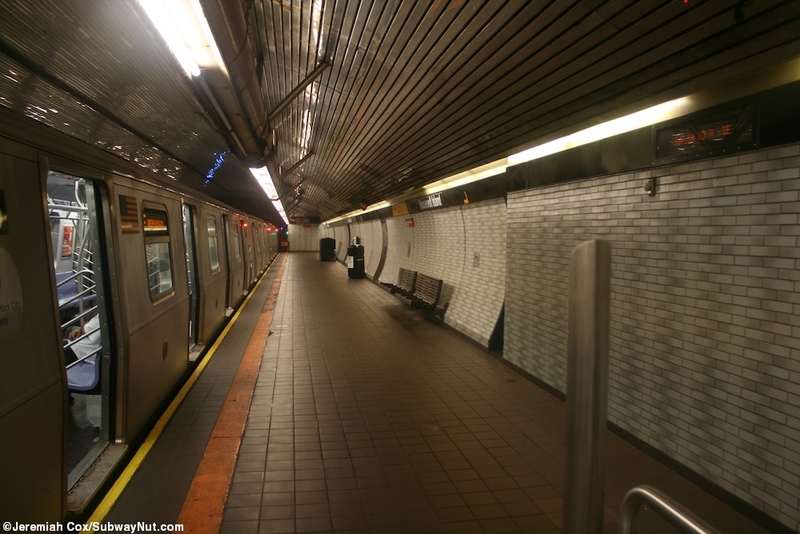 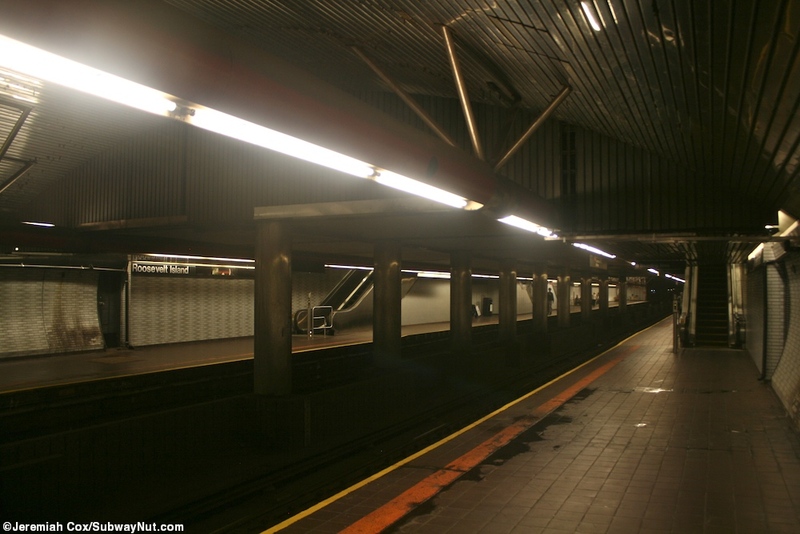 The stop has two side platforms for the two track line, located in a large tunnel opening with a curved silver ceiling and curved walls and red light fixtures holding up a line of florescent lights, with no columns to support them except in its center where the lower mezzanine is where there are just a line of columns between the two tracks. 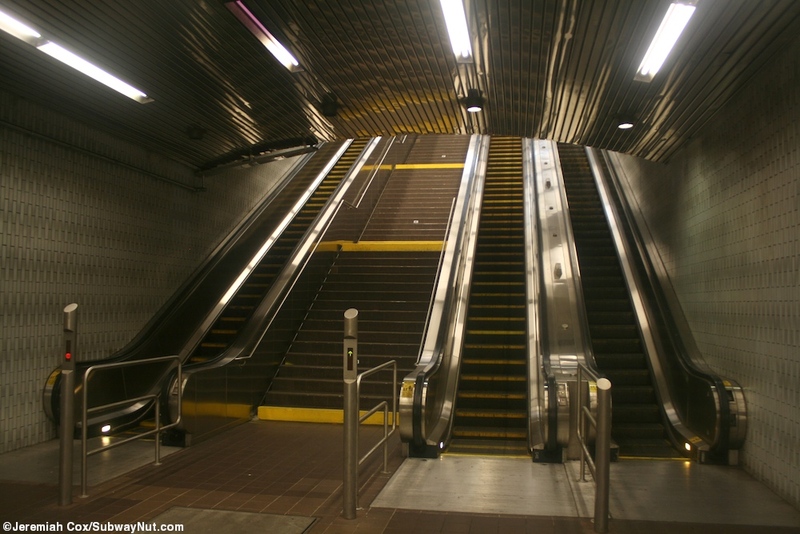 Here two escalators and a staircase lead up from each platform to a wide area with a few benches on it. 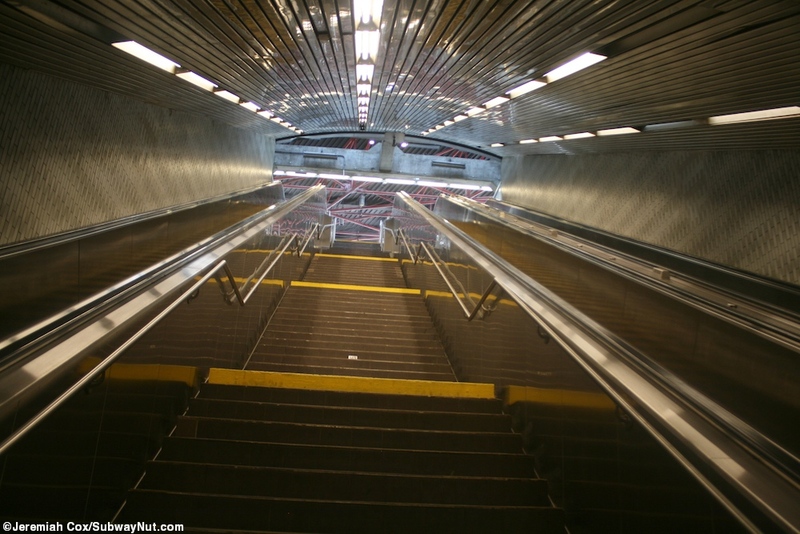 To reach the surface your still two long escalators away. 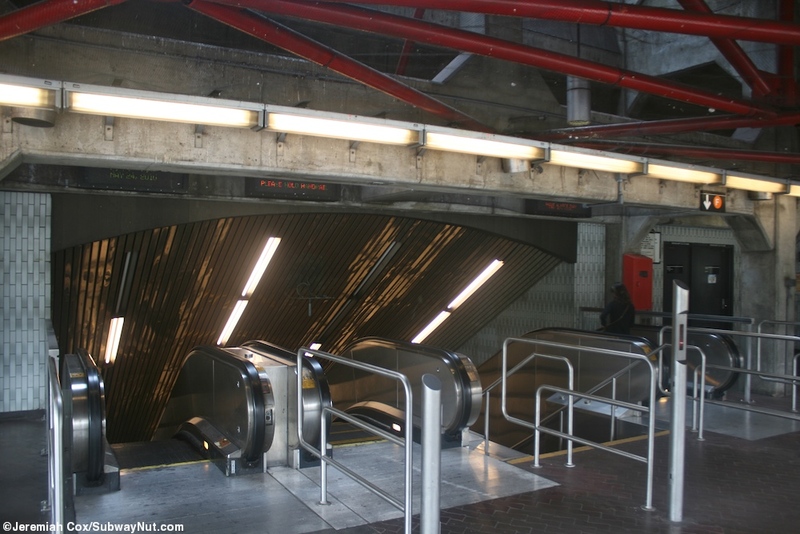 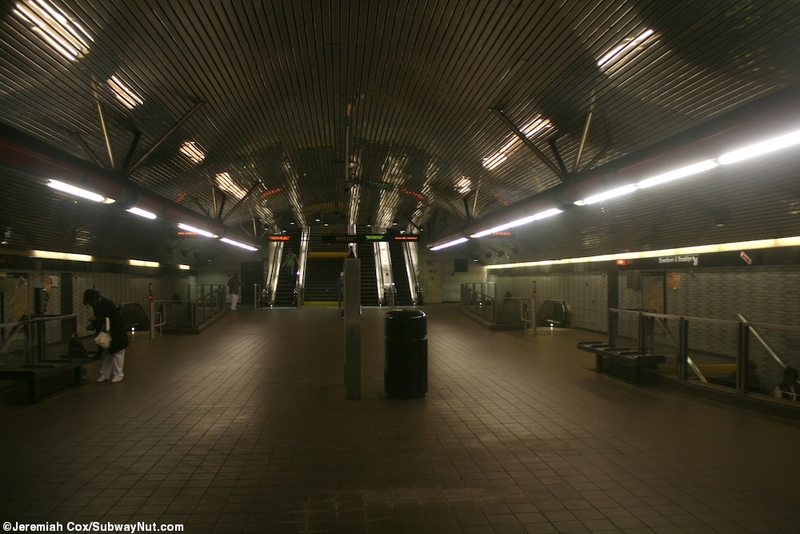 This is an area with three escalators and a staircase between two of them that stop at a non-descript intermediate landing before reaching the top landing where fare control is in a station house at street level right near the Roosevelt Island tram. 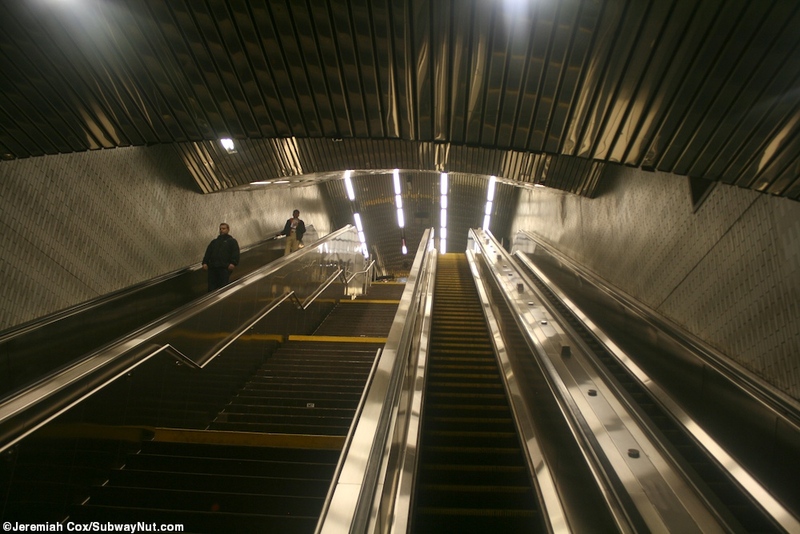 From the station house there is a long, too small for the passengers that wish to use it and avoid the long escalator ride, elevator that goes directly down to each platform at the second to last car coming from Manhattan. 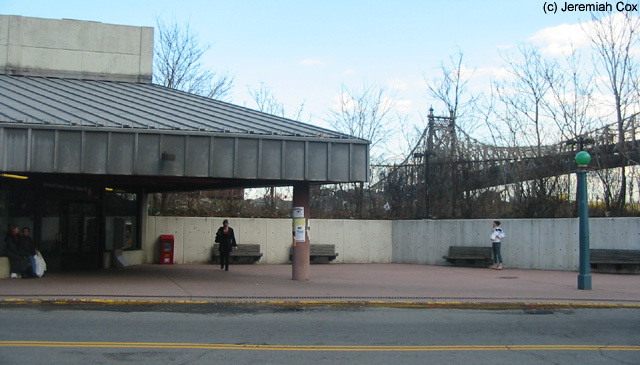 One side of the station house overlooking the bus loop (for Roosevelt Island's Red Buses) has a glass wall directly across from the escalators with two benches running along it. 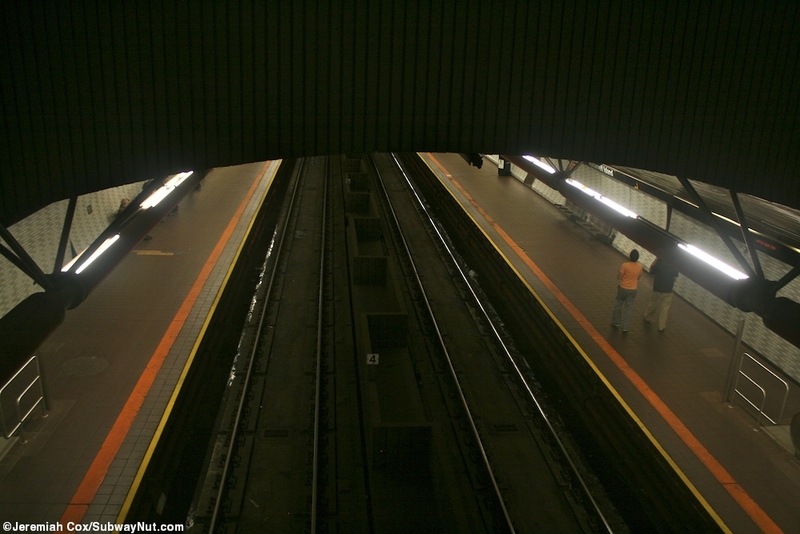 There is also a strange piece of reflective mirrors that looks like an old fashioned satellite dish. 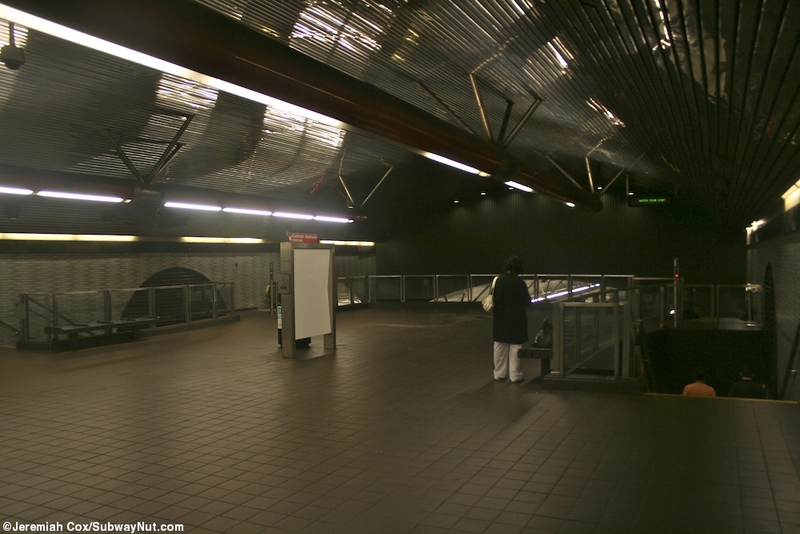 Passengers must turn a corner to reach the turnstiles in their small fare control area facing the token booth before the doors out to the street. 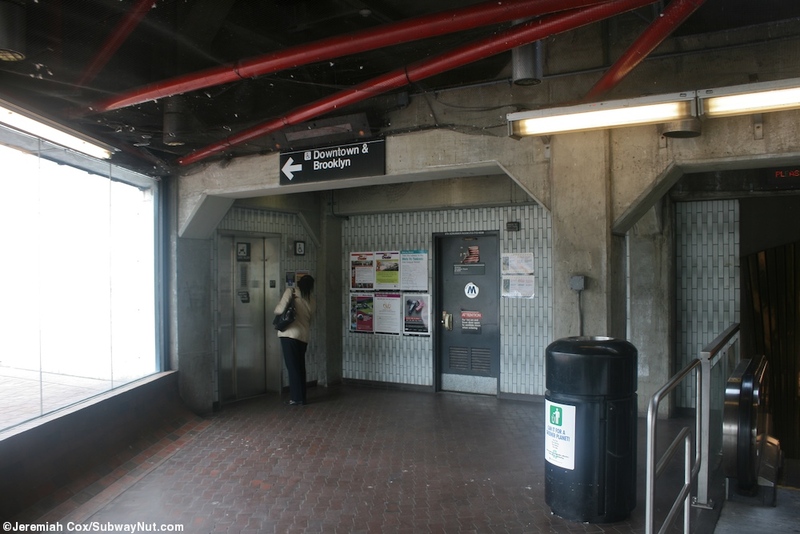 The outside is a non-descript concrete building with a silvery roof also held up by a single pink column.